City staff have told the Beaches Lions Club to scrap plans to sublease dock space at Ashbridges Bay to a company that rents WaveRunners, small powered watercraft similar to Jet Skis or Sea Doos. Also at issue is a concrete pad that the company, Toronto WaveRunners, built along the docks beside the Lions Club boathouse so it could put up a storage shed. Ryan Glenn, business services manager for Toronto Parks, Forestry and Recreation, says the WaveRunner plan doesn’t fit the intended use of the Lions’ facility at Ashbridges Bay as a not-for-profit sailing club. Glenn said the city only found out about the plan when a parks employee saw Toronto WaveRunners staff pouring cement on the site, which is part of the conservation land owned by the Toronto and Region Conservation Authority. 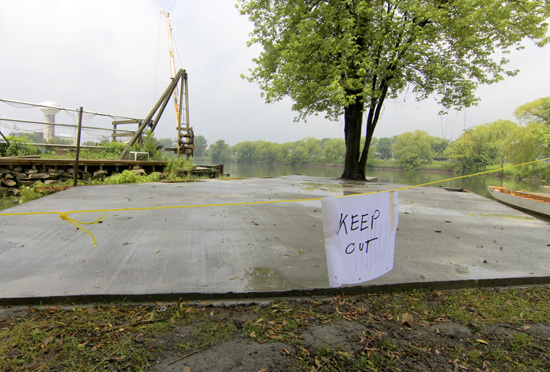 Beaches Lions secretary Andy Buhot says he hopes the club can keep the cement pad, which the club wanted in before running boat tours to the Toronto Islands during an international Lions Club convention next July. While he said the Lions Club should have spoken to the city first, Buhot thnks the whole concrete issue is a red herring. As for renting its dock space, Buhot said the club is facing higher utilities costs, roof and plumbing repairs, plus some $10,000 in flood damage caused by back-ups in the city’s stormwater system. Renting space to Toronto WaveRunners for July and August was meant to help the Lions Club handle those costs. Buhot said the club had yet to sign a contract with the company and the idea was to have all the WaveRunner renters ferried east of the Toronto beaches and well offshore before they could ride. “The bottom line is we did not expect that operation to have an effect on anybody,” he said. Toronto WaveRunners owner Shaun Talbot said the whole issue comes down to a bias against WaveRunners. Talbot said if his company is not generating profit on the Lions Club property, he can’t see the issue. “There’s a fine line whether I’m operating a commercial operation or whether I’m leasing dock space off of the Lions Club,” he said. Talbot said his plan was to store a floating dock at Ashbridges Bay, which his staff can use to ferry groups of eight to 12 riders and their WaveRunners to a point east of the Toronto harbour boundary at Victoria Park Avenue, where the renters won’t need a harbour licence. Toronto WaveRunners started taking bookings online on June 15, and Talbot said they started taking riders out last week using the public boat launches at Ashbridges Bay. Angus Armstrong, harbour master for the Toronto Port Authority, says that option could work. Even if the plan with the Beaches Lions Club falls through, Talbot says he is determined to be the first company in the business to tap Toronto’s busy eastern Beaches. I DO CARE if these machines are running across the eastern beaches….cause I LIVE and SWIM and KAYAK in those waters!!! Victoria Park is a short walk to the Silverbeech boathouse area where their are lots of swimmers and non-powered watercrafts. Last week two kayaks and a bunch of paddle boarders nearly got wiped out by a small powered water craft. Most casual boaters DO NOT know about the rules of the water, they are usually not paying attention to swimmers or others in the water, and they come to close to shore at high speeds. Waverunners are fun, but they are also dangerous. Put them far away from the swimming beaches…please. Before someone get hurt or killed. I find it astounding that anyone who operates a business or property in the city or on the water would publicly say “It wouldn’t have dawned on us that we would need approval to improve the thing.” You need a permit to do anything when it comes to building and renovation. You particularly need to pay attention when you are doing construction by water because of the implications to shorelines, wildlife habitat and water quality. So WaveRunners or not, doing improvements always requires a permit. I don’t begrudge the Lions for trying to make some money, or prepare for their convention on the island next year, but you have to go about it the right way. Looks like someone got caught out and is doing some fast back pedalling now. There is no “fine line” as described by the company spokesman. It is either a commercial operation or it is not. The city provides leases to boat clubs at reasonable rates because they are not commercial operations. Apparently they have called out the company on those grounds. There is also a requirement for boat drivers to have a Powered Vessel Operator’s Permit issued by the Toronto Port Authority in addition to the Pleasure Craft Operator Card required by the province. This permit applies to personal watercraft such as jet skis as well as power boats operating within the Port of Toronto, which extends far beyond the harbours and shoreline from Humber Bay to the Harris water works. It can’t be obtained on line and a written test is required. Adhering to this rule would limit the rental operation to persons who already have obtained this permit. Nothing on the Toronto WaveRunner website flags this requirement. Robert, that’s interesting information that I would bet most boaters are unaware of. I have certainly had my boat in these waters many times and have never heard of this requirement until you pointed it out. It might be a good idea if the Port Authority posted this information at public boat launches within these waters, such as at Ashbridge’s bay. The contributions of the local Lions chapter has made to our community is immeasurable therefore it is very disappointing to read the comments made by Mr. Buhot which I believe do not cast the Lions organization in a favourable light. Rather than admit that a mistake in judgement was made and seek to make amends he has opted to go on the offensive, disparaging the community as being closed-minded. The Lions have a long legacy in the Beaches but his strident support of WaveRunners shows how out of touch he is with local sentiment. What is equally troubling is the length that he would go to accommodate this venture, compromising the stewardship of conservation authority land, claiming that the site is no more than “garbage from construction sites” and of little use. Neither which is true. The fact is that the Lions site is well used already and by organizations that the Lions themselves have supported. Balmy Beach Canoe Club (BBCC) also a not-for-profit organization, has for years run successful, well attended paddling programs for local kids, youth at risk and para-athletes alike from the site. In being so blatantly in favour of the WaveRunner enterprise over the current legitimate tenants and users it appears he has given scant thought to the young paddlers in the water. Mr. Buhot’s intentions of raising additional funds for the club are understandable but in light of the financial pressures maintaining the site clearly puts on the Lions, perhaps the organization needs to address whether running sailing clubs and maintaining these sorts of facilities really furthers their service to the community. While the current situation with WaveRunners has cast a pall over the Lions stewardship of these parks and waterfront lands there is no need for the Lions to further sully their reputation or dig themselves into a hole financially. Do the Lions really need to maintain a “clubhouse” on the waterfront? Maybe it’s time to crackdown on boats altogether, especially amateurs on Jet skis. Even the professionals are on a closed course. After all we wouldn’t want any injuries.